MILWAUKEE -- Steve Clifford's Charlotte Hornets notched an 18-point win Friday night against the Atlanta Hawks in their home opener. The moment that game ended, the clock started ticking: 70 hours to prepare for a Monday night game against the Milwaukee Bucks and the player who has been the story of this week-old NBA season, Giannis Antetokounmpo. By the next morning, the coach started catching up on tape of the Greek Freak. Clifford freely admitted it: It was fun. He took joy in watching such a transcendent player, especially one who is so young and is blossoming into a superstar before our eyes. For the first day of watching Bucks' tape, Clifford enjoyed it like a fan. 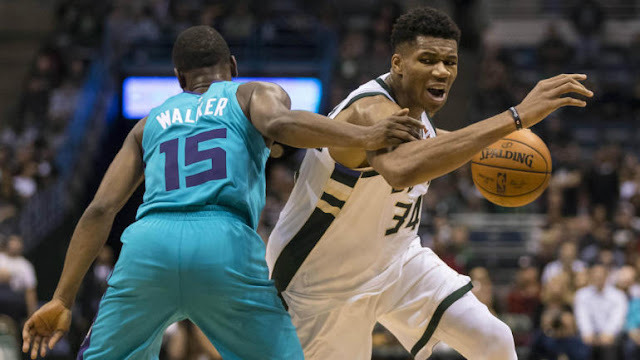 He was like all of us who have been transfixed by the numbers of Giannis' first three games -- averaging 38.3 points on a ridiculous 67.2 percent shooting, with 9.7 rebounds, 5.0 assists and 2.7 steals -- as well as his unprecedented style as a seven-footer running point and dominating every facet of the game. "That's one of the nice things about this league," Clifford said. "We played Friday, so Saturday you start watching the other team. And Saturday you can sit and enjoy his greatness. It's not just his size and his athleticism -- he has an energy level and a flair and a passion for playing that's fun to watch.